Megan: Every September, as the days grow shorter and the evenings cooler, I find myself wondering how summer could possibly have flown by so fast. I hang up my sundresses and put away my swimsuits for another season. As vacations (and summer Fridays for the lucky ones!) wind down and the schedule returns to a more regular 9-5, my calendar once again starts to fill up with post-work happy hours and dinner parties. Special events during the work week require outfits that can transition from desk to dinner with a swap of a shoe and a swipe of lipstick, so I’ve pulled together three looks perfect for week night festivities and celebrations. Megan: If you’re headed straight from a day at the office to a date with a special someone, I love the idea of a long sleeve little black dress with some extra embellishments. 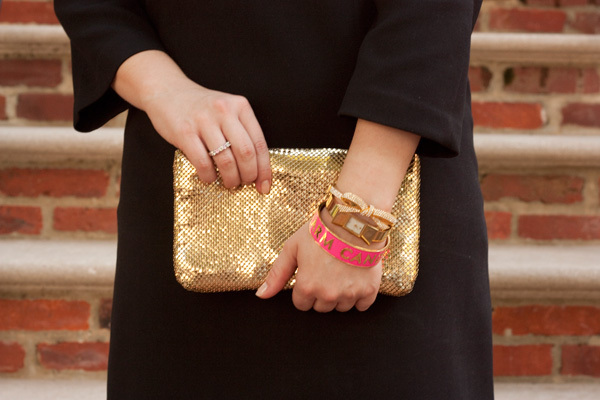 The gems and metallic accents make this Kate Spade number special, while the ponte fabric and shift style keeps it from feeling too formal. For day, I’ve paired it with pointy-toed flats and let the neckline be the main accessory; for the evening, I’ve turned up the glamour by swapping the flats for a great pair of hot pink pumps and added a few more bangles and baubles and a sparkly clutch! Megan: My love of fancy pants cannot be overstated, in part due to their ability to be dressed up or down. They are just as appropriate in a professional setting as they are at a dinner party with friends, and just a few swaps in styling can take them from day to night quite easily. 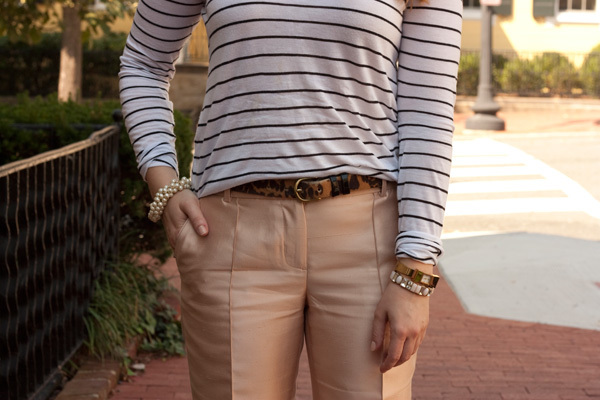 I've paired this pair of blush-colored satin pants with a nautical striped top and a leopard belt. For the office, I've paired them with a simple, classic black d'orsay pump, and for the evening, I've paired them with a bolder gold cap-toe pump. 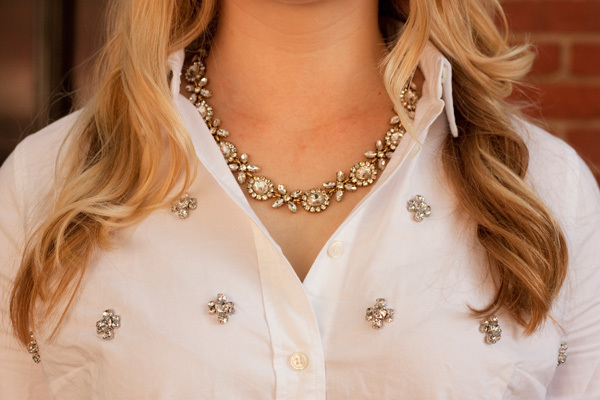 It feels fancy without being fussy. 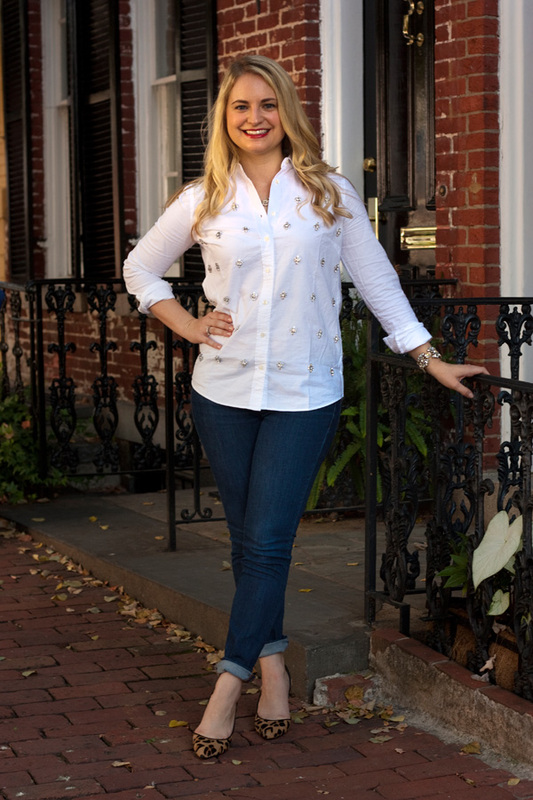 Megan: If you work in an office where you can get away with jeans on Fridays (or Thursdays or Tuesdays, as the case may be), try dressing them up with a few special pieces to take them from the workday to drinks with friends. 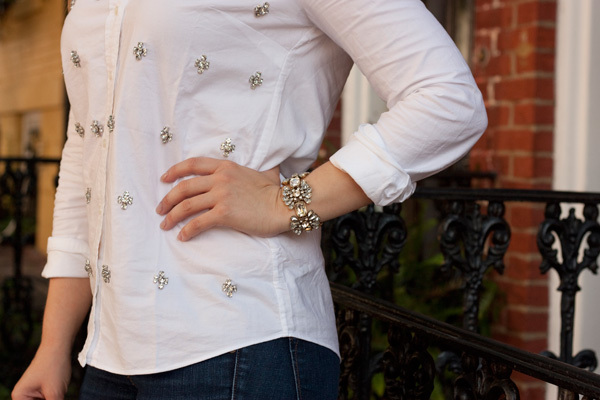 This outfit couldn't be simpler - essentially just a white button up shirt and a pair of jeans - but the embellishments and accessories make it festive. I've paired it with sparkly flats for day and a great pair of leopard d'orsay heels for the evening. A few extra crystals, and you're ready to pop the bubbly!